How to Measure the Impact of Your Paid Search Activity in a Multi-Touch, Multi-Channel World | Clicteq | PPC Agency London, Humans, I don't see any? In the context of digital marketing, attribution is the modelling process used to determine how much credit lies with each touch point for a conversion. Attribution can apply across channels (so Paid Social vs Paid Search for example), as well as within channels (so one campaign vs another; one keyword vs another; one device vs another). It’s important to have a fundamental understanding of attribution, as it will impact where and how you invest your time and money – and so, will have a real world impact on how effectively you drive revenue. With individual platforms offering a variety of attribution models, as well as a series of multi-channel options available, it is a tricky space to navigate. This post aims to deal with understanding and choosing an attribution model that works for you. It does not deal with tagging, conversion windows, or how to read your performance data after changing your attribution model. Watch this space for content coming on those topics – or, even better, subscribe to the blog and you don’t have to watch the space at all. Below I’ve outlined the attribution model options (along with the pros and cons) for the most popular Paid Search and Social platforms, as well as a selection of multi-channel options. How: Data-driven attribution uses machine learning to determine which keywords, ads, or campaigns have the greatest impact on your goal. Why: In theory it’s the most accurate attribution model, regardless of the growth-orientation of your business, or how well established you are. Why not: The algorithm used is a black box, and it’s not available to everyone: you need to have 15,000 clicks and at least 600 conversions for the specific conversion action you want to measure over a 30 day period. If you drop below the conversion threshold, your data-driven model will default to being linear (more information on this model below). 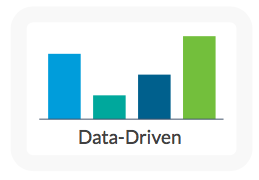 If possible, we would definitely recommend using data-driven for a holistic view of what is actually driving value in your account. These 3 could be classified under the same umbrella of rules-based, multi-touch models. They all represent ways of attributing conversions to touch points in the user journey, and should be used if you don’t yet qualify for data-driven attribution. Don’t just choose randomly between them though – they are 3 distinct models, aimed at directing your organisation’s spend at earlier or later touch points depending on your growth ambitions and market share. 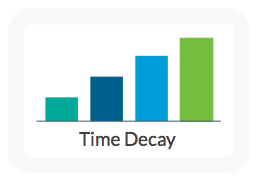 How: The time-decay model gives more credit to the touch points closer to the conversion point – the theory being that those were the most influential in finally tipping your client over the edge into purchasing. Why: If you are considered a market-leader in your business, don’t have to vye for business against competitors too often, and have a conservative growth strategy, this is the attribution model for you. That’s because you are likely to want to attribute greater value to the touch points closer to the conversion, and see less value in the initial contact. Why not: If actually you know one of your greater marketing hurdles is to gain interest from potential clients in the first place, this model could lead you to over-investing in lower funnel campaigns. In other words, it could damage your prospecting pipeline. 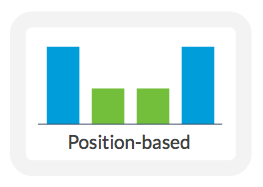 How: Position-based attribution distributes 40% of the conversion credit to both the first and last touch points, and evenly distributes the remaining 20% to any other intermediary touch points. Why: If you are operating in a crowded market, are fairly new to the business, or don’t have an established share of voice, this model could work for you. This is because the position-based model emphasises the importance of first gaining the interest of potential consumers, as well as that final conversion point – both of which are valuable for a new business. Why not: If the market you are operating in isn’t as competitive as you thought, or building new leads is relatively simple, this model will over-encourage investment in early touch points. Equally if the path to conversion is simple post the first click, this can over play the role of the final touch point. 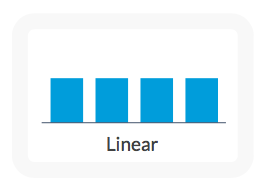 How: As you’d expect, the linear model distributes credit evenly across all touch points. Why: If you are not using a data-driven model and instead are opting for something rule-based that is not linear, you are by default making a judgement on which interactions you believe are most valuable. You may not be comfortable making that call straight off the bat, so using a linear model allows you to get the data first. You can then consider changing to a time-decay or position-based model. Why not: It will not reflect the challenges your business faces at different touch points. It’s likely that if you’re not sure how much you need to prospect versus how important the final conversion point is for you, then you would benefit from a position-based model. These two models are respectively the most widely and probably least widely used, and both only attribute value to one touch point on a user’s journey. 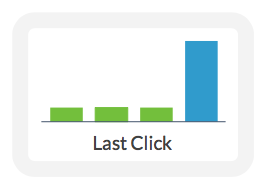 How: Does what it says on the tin, last click attribution gives all the credit to whatever drove the last click before a conversion. Why: If you are not sure which model you should be using, you are most likely using this one. That’s because it is the default within Google Ads. This attributes the most value to that final conversion touch point, the interaction which pushed your customer past the finishing line. Why not: Clearly last click downplays the role of every other touch point and can encourage under investment in upper funnel campaigns and channels. Rumours have been flying around for the last year that Google will actually sunset the last click model. This is part of their move towards a more holistic approach to PPC (i.e. Google AdWords rebranding as Google Ads). How: How did you guess?! 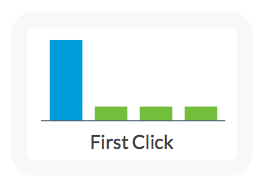 First click attribution gives all credit to the first interaction your consumer had with one of your ads. Why: Arguably that first touch point is what introduces a customer to your site (in the digital world anyway), and so should be accredited with bringing the conversion in. Why not: If the first click was solely responsible for bringing in a conversion, it would also likely be the last click, making the logic for using this attribution model fairly redundant. Last click – that’s your only option in Bing. It behaves in the same way as Google Ads’ last click attribution. It’s important to bear that in mind if you do change attribution models in Google Ads, that it’ll become harder to compare performance directly between the two platforms. That can be mitigated with a multi-channel approach, which we’ll come on to. Facebook attribution models very similar to Google Ads’. You’ll notice there is no first click model. Instead, there is number 4 – last touch. The last touch model is extremely similar to number 3, last click or visit; the difference is that last touch takes will credit to the last impression of an ad, if it can’t attribute to a click or visit. It is therefore a more generous model than last click or visit, but again downplays the role of earlier interactions. There is only one attribution model in LinkedIn: last-touch. That means credit is given to the last creative clicked, or, crucially, viewed. Bear this in mind, if you are comparing performance across social channels in case you have your Facebook set to last click or visit: LinkedIn is more generous in its attribution model. On the surface, Amazon uses a fairly simple last-click model. However, you have to be wary of “brand halo” attribution that may be over-inflating your ROI on Amazon, particularly if you have resellers of your products. For example, say your brand, Awesome Bags, has a reseller on Amazon called Bits & Bobs. Bits & Bobs also resells products from Not So Awesome Bags. You launch a Sponsored Brand Ad on Amazon and place an ASIN in it that directs potential customers to Bits & Bobs’ page. A few customers go on to buy a Not So Awesome product from Bits & Bobs – which are then attributed back to your campaign. Crazy right? An unusual case perhaps, but definitely worth bearing in mind. So, being able to attribute conversions within an account is all well and good, but if you are running more than one channel, or are concerned primarily with the overall performance of your marketing channels, you really want to be looking at a multi-channel approach. One of the most straightforward (and largely free) options is using Google Analytics. How: This is a variation on the more traditional last click model. Non-direct last click attributes conversions to the ad that drove the last click before the conversion. If someone clicks on a Paid Search result, then leaves the site, and comes back through Direct – it will be attributed to the Paid Search ad. On a last click model, that conversion would be attributed to the Direct channel. Why: This has the same advantages of a last click model in attributing value to the touchpoint that drove a customer over the edge to conversion, whilst also not overplaying the role that the Direct channel can have. After all, something must have driven the customer to you directly in the first place. Also fairly importantly, you have to use this model, unless you’re willing to pay $150k a year and upwards. Why not: As per the last click model, this downplays the role of every other touch point in getting your clients to convert, and can lead to over investment in lower funnel channels. A great feature of Google Analytics however, is the ability to model the performance of your channels under different attribution channels. It is very straightforward to compare channels, and models, to each other. This is done by navigating to Google Analytics’ Model Comparison Tool (found under Conversions, then Attribution). How: Unsurprising from a Google product, Google Analytics allows you the option to attribute to the last click that took place from any activity you are running in Google Ads. Why: This is useful if you currently have your Google Ads account set to a last click model and want to compare results across both platforms. It’s also useful for comparing channel performance within your Google campaigns in the Analytics platform. Why not: Clearly if the last click prior to a conversion did not come from a Google Ads campaign (e.g. it was organic, or direct, or from social) and you want a realistic multi-channel view, this model is not helpful. How: Custom attribution models allow you to create your own model, from a combination of a baseline attribution model (from the list above), with a custom lookback window, and layered with rules regarding user engagement and “custom credit” rules. We can write a whole other post on creating custom attribution models, but essentially it means you can weight attribution towards interactions that encourage more interaction with your site than others. On top of that, you can create your own rules to upweight interactions, by whatever scale you like, depending on a variety of factors (e.g. position in path, landing page, search engine, targeting type). Why: Clearly this gives you a lot of control over attributing conversion value within your business. It is also some kind of proxy of data driven attribution, which is only available in Google Ads 360. Why not: You need to already know what is driving value for your business, and be confident in that knowledge. As alluded to above, in the paid-for Google Ads 360 data-driven attribution is also available. That has the same qualification conditions as in Google Ads, and comes with the same pros. As also mentioned above, it’ll cost you a fair whack at $150k minimum per year, so do really consider whether the investment is worth it for you. Amazon may be releasing a game changing attribution solution, with a few big caveats. Currently, it is available as a closed beta, for US and Canada only, but it could prove to be very powerful for sellers on Amazon. For the first time, brands can measure the impact of display, search, and video channels based on how consumers discover, research, and buy their products on Amazon. If successful and extended, that could join a lot of dots in the attribution game for ecommerce companies. Finally, a brief word on Google Attribution. As per Amazon Analytics, Google Attribution is the name of a multi-channel attribution service (with free and paid-for versions) that Google announced in 2017 would be rolled out to the masses. It is still in beta, and in theory brings together Google Ads, Google Analytics, and Search Ads 360 data to create a truly holistic view of all your digital marketing channels. Will it ever be rolled out to the masses? Who knows. If it’s an option you are keen to explore, you’d be best off getting in touch with a Google account manager / rep to see if you there’s any space on the beta. 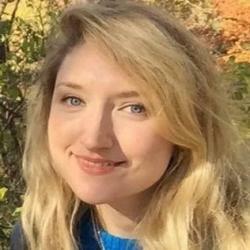 So, what is the best attribution model for you? Where you have a choice, for single platform attribution you need to consider your place within the market and your growth strategy. If you want to attribute across channels, for now Google Analytics modelling function is your best bet, but make sure you are comparing between meaningful models for your situation. Going forwards, Google Attribution and Amazon Attribution could be real game changers in allowing advertisers to connect all of their dots – a move that will likely encourage more investment in the upper funnel channels and away from pure Search. Amy joined Clicteq in March 2019 as a Paid Search Account Manager. She has a wealth of experience in managing enterprise retail and lead generation paid search accounts including BMW, Hive, Secret Escapes and iRobot.